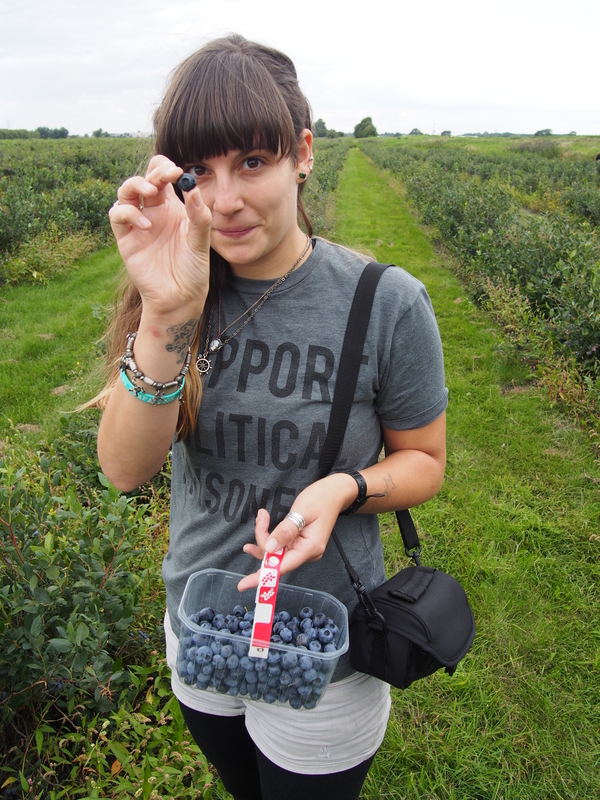 I have spent alot of time driving along the A47 towards Norwich these last few months to visit friends and family, and everytime I drove past the sign for Pick Your Own Blueberries at Fairgreen Farm, I wanted to stop but never had the time. When we finally stopped it became the most exciting few hours. Just rows and rows of blueberry bushes… the blueberries so huge I had never seen anything like them. I felt like a kid in a sweet shop! The couple who run the blueberry picking were so lovely, spending the time to show us around, explaining how to look after the blueberry bushes, showing us all the different varieties… such as draper, liberty and blue crop, all of which you think is your favourite …until you try the next kind. It was so interesting to learn from the blueberry experts just how pointless it is to buy blueberries from the supermarket if what you are after is the nutritional content! 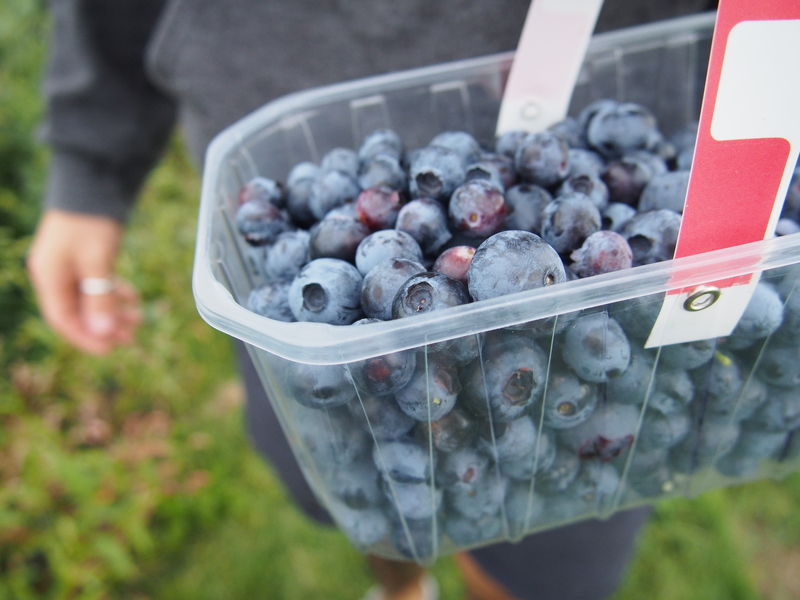 As well as being much more expensive, the blueberries are actually picked whilst still green, then artificially ripened until blue (in the same way tomatoes are ripened for supermarkets…always buy tomatoes on the vine!) 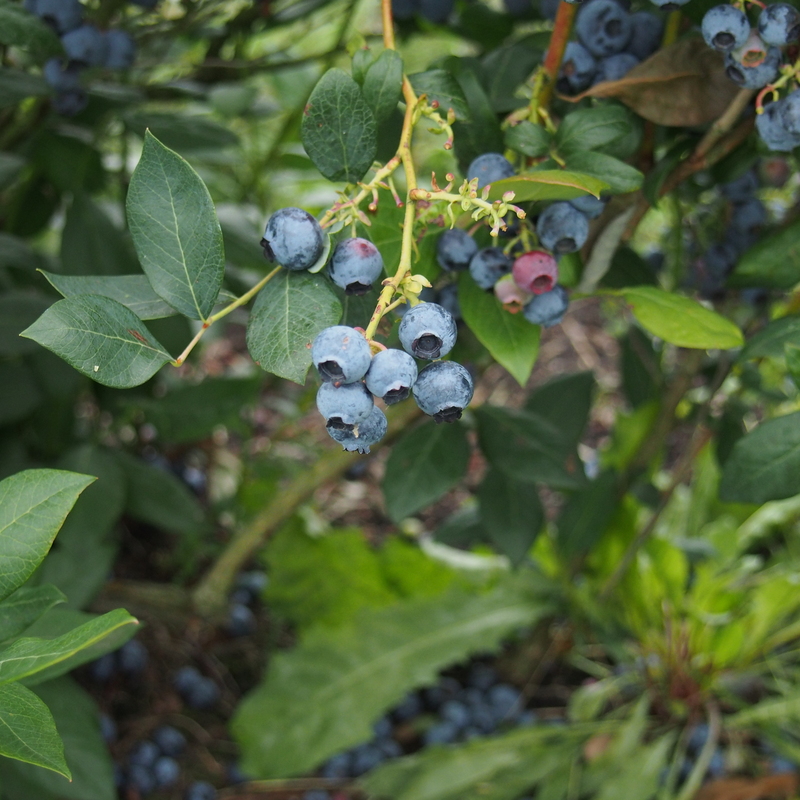 All those amazing antioxidant qualities that make blueberries so special are lost when they are picked too early and not given the time to mature and ripen naturally and take all the goodness and nutrients from the soil. 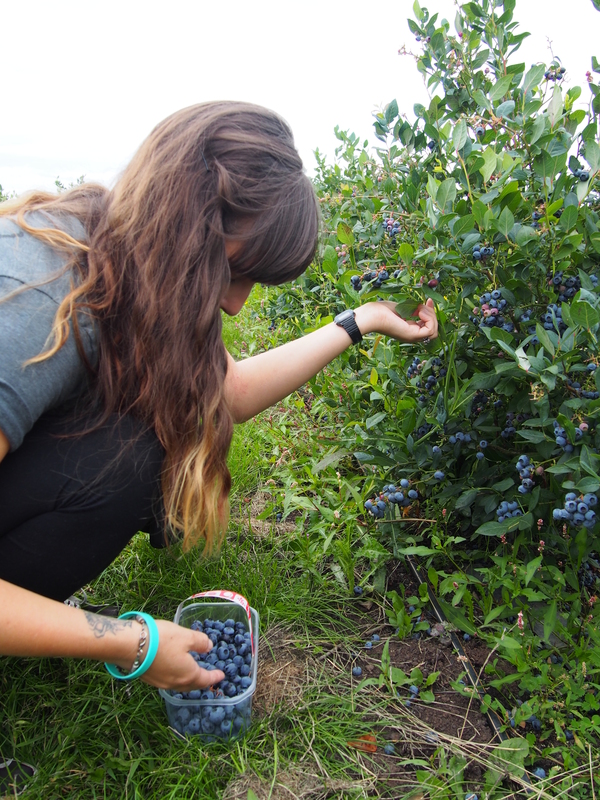 Not only are these blueberries at place like Fairgreen Farm better for you, they taste incredible. I literally felt like I have never tasted a proper blueberry until I tasted these. There really is no comparison! Its only £5 for a kilogram of blueberries, cheaper than the supermarket, as well as being a thousand times better in taste and nutrition. You can also pick up a ready picked box for £7 if you don’t have much time, or a whole bucket for £40 so you can freeze some for the winter. (To freeze just put straight into some Tupperware without washing and place in freezer.) You can also purchase ‘less than perfect’ blueberries at a cheaper price for jam making. After returning home with kilos of blueberries I knew I had to make something special… or many things to share on The Grumpy Sailor. So I started with blueberry jam using the jamming blueberries I got at Fairgreen Farm. 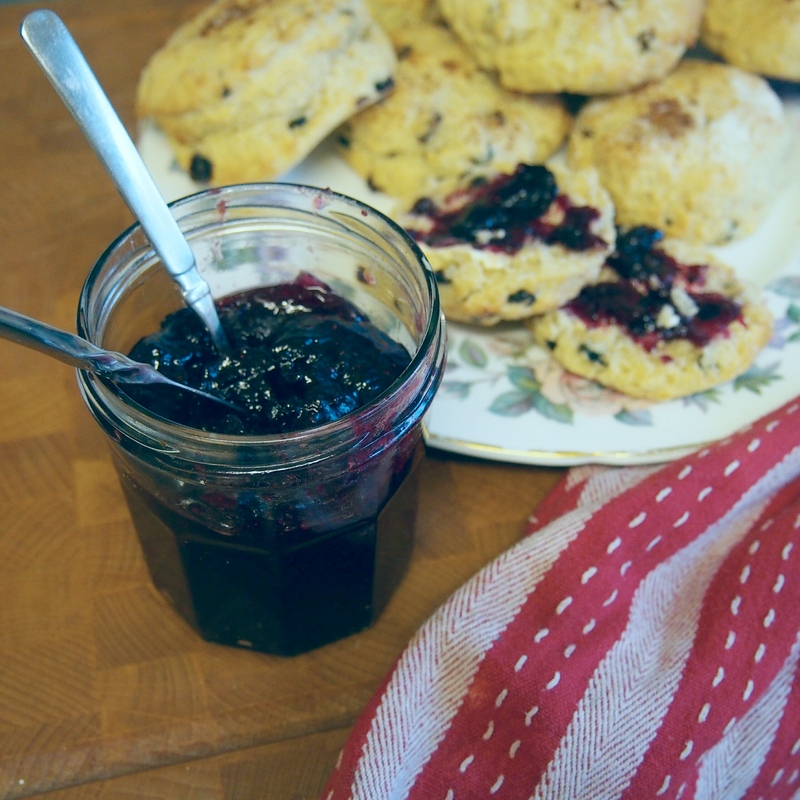 And nothing goes better with homemade jam than English Scones! Preheat oven to 200°c and lightly grease a flat baking sheet. Sift the flour, sugar, baking powder and salt into a large non-metalic mixing bowl. Making sure the butter is cold, add to flour and using either a pastry cutter or two knives, cut the butter into the flour until pea sized chunks are spread evenly throughout. Make a well in the middle and add the milk and vinegar mixture. Use a fork to gently mix ingredients until just combined. Turn out dough onto floured surface, sprinkle flour on top and on your hands and pat the dough flat, until approximately 1½-2 inches thick, handling as little as possible. 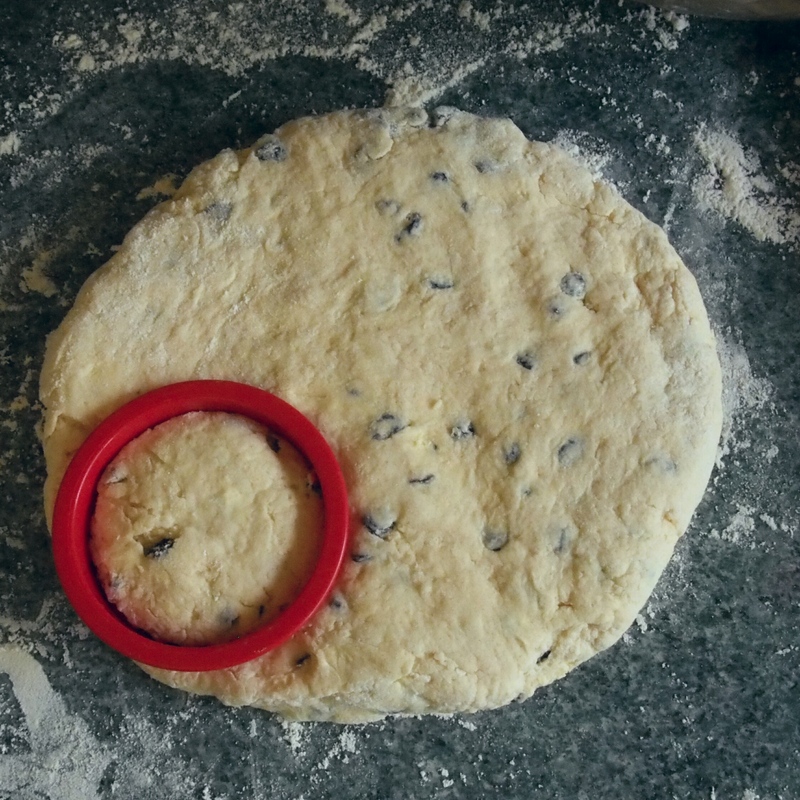 Using a 2½-3 inch round scone cutter (dipped in flour to prevent sticking) cut rounds out of dough and place on the greased baking sheet. 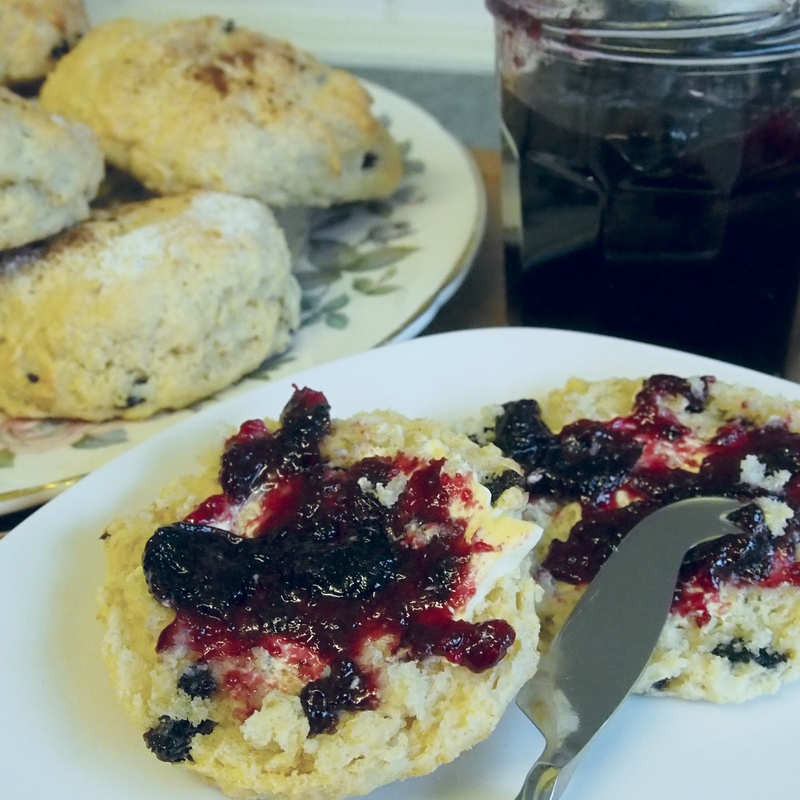 To get the last scone you may need to briefly knead the leftover dough and pat flat again, though try not to over handle the dough. 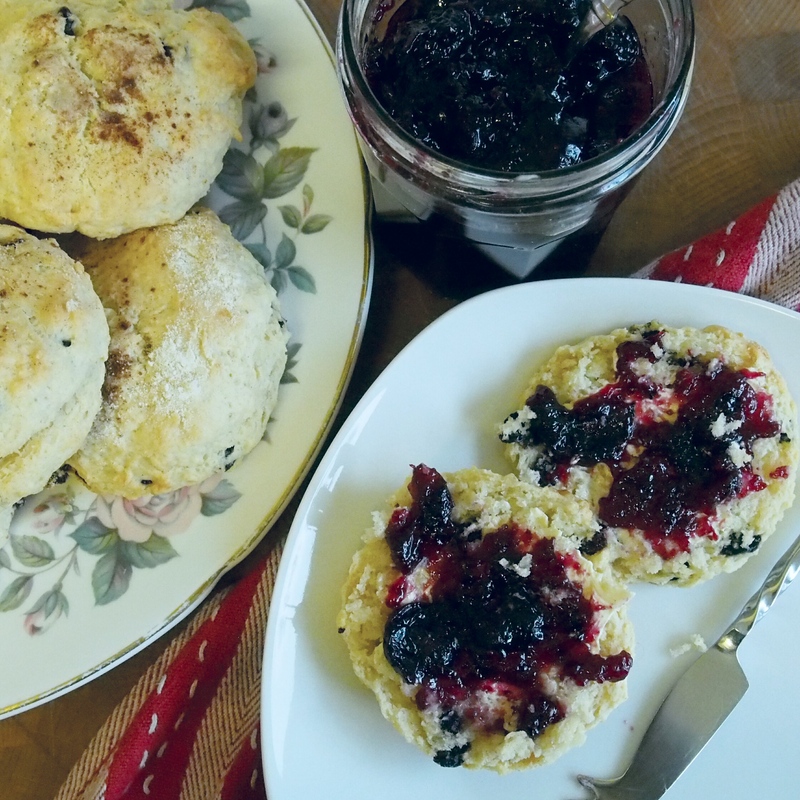 Brush tops with a little milk and sprinkle with a little cinnamon and brown sugar and bake scones for 12-14 minutes until golden. Place washed blueberries in a heavy bottomed pan with lemon zest and juice. On a medium to high heat cook blueberries and lemon for a minute or two just to soften. Add sugar and bring to the boil and dissolve sugar. Boil for 6-8 minutes once sugar is dissolved. The mixture will thicken. To check it has reached the setting point, place a teaspoon on mixture on a cold plate. If the surface wrinkles when pushed after a few seconds the jam is ready to come off the heat. Let cool for 15 minutes and transfer into sterilised jars. Heat oven to 130°c, no hotter and place glass jars directly on your oven shelf, not touching. Leave for 20 minutes, remove and place on a heat proof mat. Add jam when the jars are still warm/hot making sure then jam mixture is also still warm. Adding cold jam will cause the jars to shatter. Screw on the lids while still warm.. the heat will seal the jars closed. thanks so much! I really enjoyed making them. Some of those blueberries really are massive! I’ve never heard about them being picked green and artificially ripened. Great info!! Now I’m feeling very envious of your wonderful blueberry jam. Thanks for your comment, yep they were so huge I had never seen any like that before. So glad to have discovered that place. I will definitly be returning alot!